Our sports medicine specialist is a former Olympic rower, making him one of the most qualified sports doctors around. Common conditions he treats include arthritis, bursitis, carpal tunnel, nerve conditions, concussions, fractures and sprains, trigger finger, rotator cuff strains, cervical radiculopathy and lumbar radiculopathy. Dr. Andrew McMarlin is board-certified in sports medicine and brings 25 years of elite athlete experience to his patients. 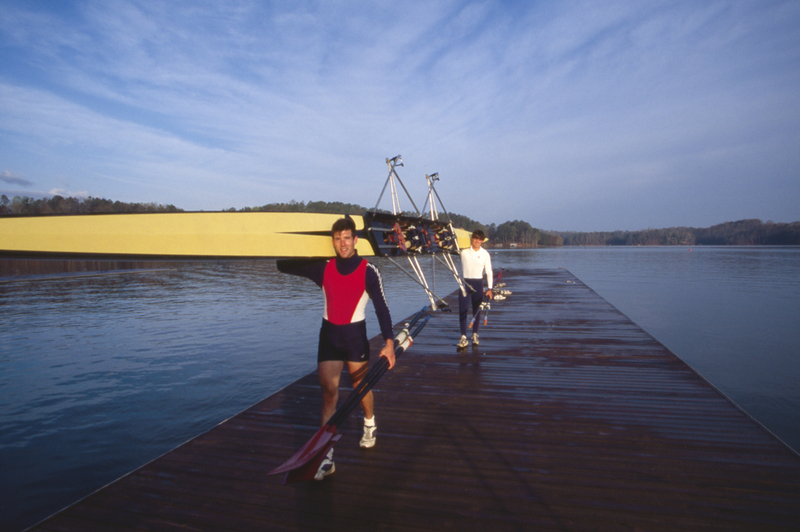 As a ten-time world Dragon boat champion paddler and a US Olympic Rowing Trials winner (Atlanta Games), who currently holds two world records, Dr. McMarlin represented the United States in the Men’s Double Sculls and is currently a volunteer physician for the U.S. Olympic team and the U.S. dragonboat team. Dr. Andrew McMarlin's Sports Medicine experience includes serving as a physician for DC United soccer team and the Washington Nationals baseball team, as well as for high school and college teams. As a former clinical instructor for students at the Georgetown University School of Medicine and the Uniformed Services School of Medicine, he places a high value on educating patients on all their treatment options. Dr. McMarlin also served as a naval officer and has developed training programs for candidates for the Navy SEAL and Navy Pilot communities. Kasey Richardson is a certified athletic trainer who joined the Winning Health team in July 2016. She brings two years of collegiate athletic training experience, working a year each at Morgan State University in Baltimore, MD, and Virginia Commonwealth University in Richmond, VA. She worked with volleyball and softball athletes, specializing in upper extremity injuries and concussions. Kasey graduated from Florida International University with a master’s in athletic training in 2014. While in Miami, she worked with FIU’s division one football and track teams; St. Thomas University’s basketball, softball and baseball teams; Alonzo and Tracey Mourning Senior high school athletics; and UHZ Sports Medicine Institute. Kasey also had a summer internship with the Winston-Salem Dash, the Advanced-A affiliate of the Chicago White Sox. Prior to graduate school, Kasey received her bachelor’s degree in exercise science from the University of North Carolina at Wilmington. She was a four year varsity swimmer and honors scholar at UNCW, specializing in distance events and breaststroke. While in Wilmington, Kasey earned her Certified Strength and Conditioning Specialist Certification, which she uses to help with rehabilitation progressions and return to play sessions. In her spare time, Kasey plays roller derby for the Columbia Quad Squad and Team South Carolina Roller Derby. She enjoys going to the beach, cooking and reading in her hammock. Elisa Tanksley is a certified athletic trainer who joined Winning Health in June of 2018. Prior to working at Winning Health, she was an athletic trainer for Division One collegiate athletics at Appalachian State University for two years, working primarily with the field hockey and men’s and women’s track and field teams. In addition to covering college athletics, Elisa was also the Head Athletic Trainer for Appalachian State’s summer athletic camps, providing coverage for all sports camps that the university offered, such as wresting, football, volleyball, soccer, baseball, softball and basketball. Elisa is a graduate of the University of Tennessee at Chattanooga’s Master’s in Athletic Training program. While at UTC, she worked with their various Division One teams, including football, cross country and softball. She also assisted coverage with local high schools in the Chattanooga and north Georgia area as well as participated in rotations at Erlanger Hospital in the emergency room and with Erlanger family practice physicians. In her second year at UTC, she was also an assistant for the Rehabilitation Exercise class, where she helped lead and teach the first year athletic training students about various rehabilitation programs and techniques. Prior to her degree at UTC, Elisa went to Tennessee Technological University, where she received a bachelor’s degree in Exercise Science with a concentration in Fitness and Wellness. While at Tennessee Tech, she was a track and field athlete for the Golden Eagles, primarily running in the 4X400 meter relay race, the open 400 meter race and the open 200 meter race. She was also the fitness trainer for the Tennessee Tech Formula SAE (FSAE) team, helping the drivers with their conditioning to prepare them for the physiological stress of racing at high speeds. Elisa currently resides in Charleston with her boyfriend, Jason, their dog, Gracie, and ferret, Sophie. She enjoys kayaking, reading, and going to the beach on the weekends, as well as taking Gracie to the dog park and going to the 9Round gym for kickboxing.